Winter is in full swing and it’s only getting colder. I am definitely not used to this Arkansas winter, the other day it 1 degree…1 degree! This Texas girl is not cut out for this type of winter. Winter is hard to dress for, how do you dress for warmth while still being cute? Below are some easy winter style tips and some things you should definitely have in your winter wardrobe. So my mom HATES long sleeves and coats, probably why I was raised in Texas. Basically, through the months of November-March, she rolls up all her long sleeve shirts and wears a coat as little as possible. When I was younger I can vividly remember her saying we’re just going from the car to the door I don’t need a coat. Love ya mom, but as I’ve gotten older I’ve realized that’s not my outlook on winter. So don’t be silly throw on a coat and embrace the cold because it’s not going anywhere. It’s no surprise that you should be layering to stay warm, but it’s all about the type of layers you have. 1. Start with a good base layer maybe this a tank top under a sweater or a nice thick sweater. 2. Add a vest or a fuzzy layer pending how cold it is. The other day I put a sherpa coat under my puffer coat and I told Jared this is my warm winter coat combo. 3. Add something to block the wind and that has a hood like a puffer jacket. Depending on the level of cold eliminate layers as needed. The constant struggle of winter is dressing warmly while not looking like the Michelin man. When winter shopping, look for things that elongate the body like a longer coat or a coat with a belt, like this one. 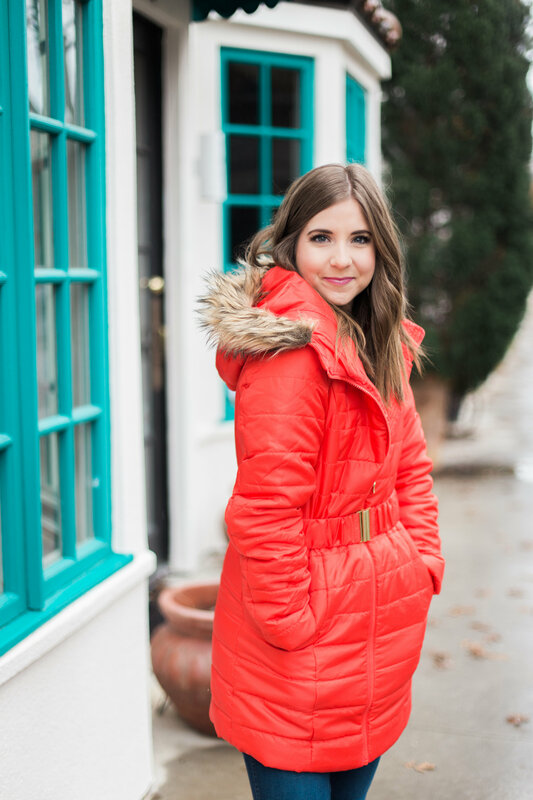 You should have at least one staple coat in your winter wardrobe that goes with everything! I have an olive green quilted coat and a navy wool coat that are on a weekly repeat. 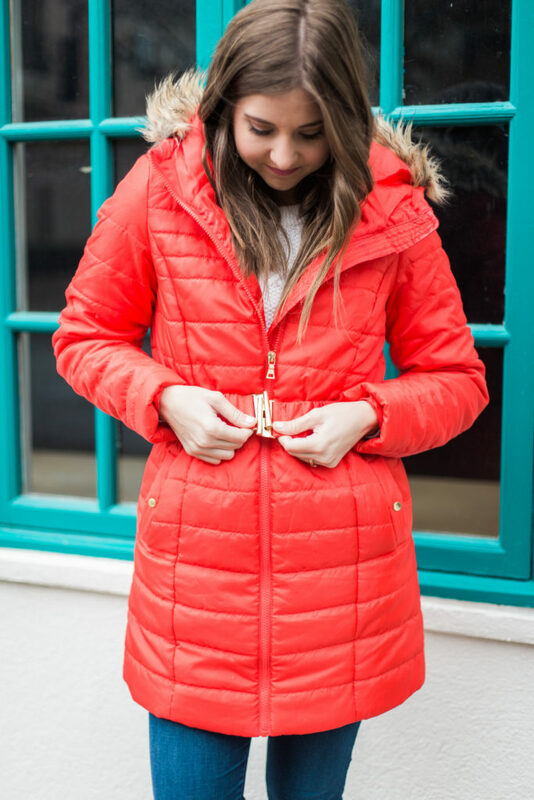 Although you should have a staple coat, some days you should need to spice it up and you need a fun coat in your closet. This will add some fun and color to your outfit in the winter months. My 3 staple shoes during the colder months are riding boots, duck boots, and Uggs. 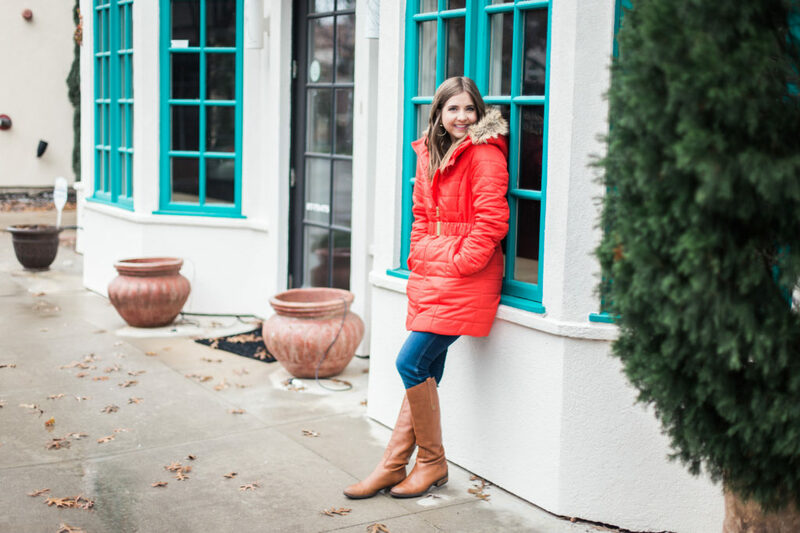 I opt for riding boots if I’m going for a dressier look if it’s a casual outfit I go for Uggs, and if it’s just stinkin’ cold or it’s rain/snowing duck boots are perfect for braving those conditions. A few things I’ve invested in this winter are a good pair of gloves, a cute but warm hat, warm scarves and wool socks. 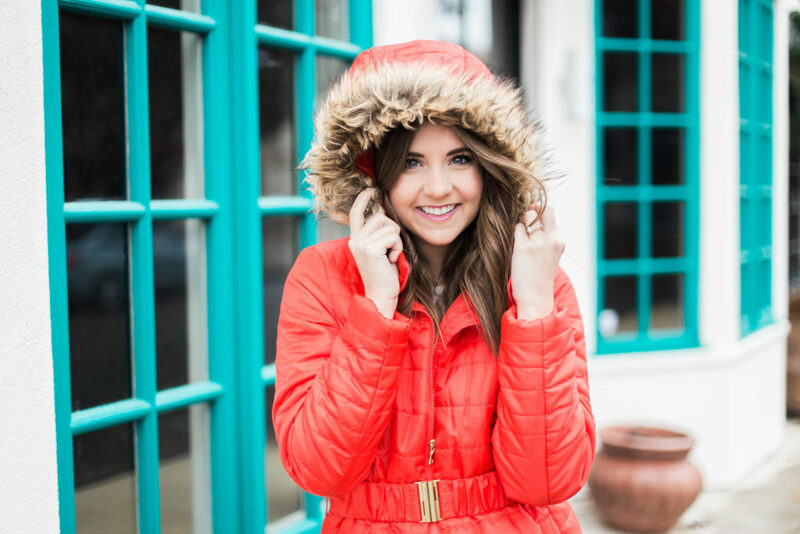 All of these are a perfect combo for cute warm winter style. Thanks for the tips! Very helpful for getting through winter, but I’m SO ready for spring! I’m so ready for spring too! !